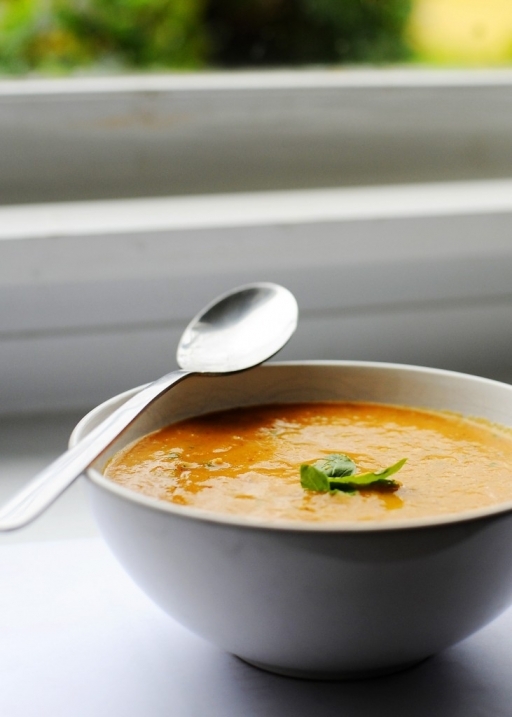 There is nothing better than a good soup when it gets cold outside. 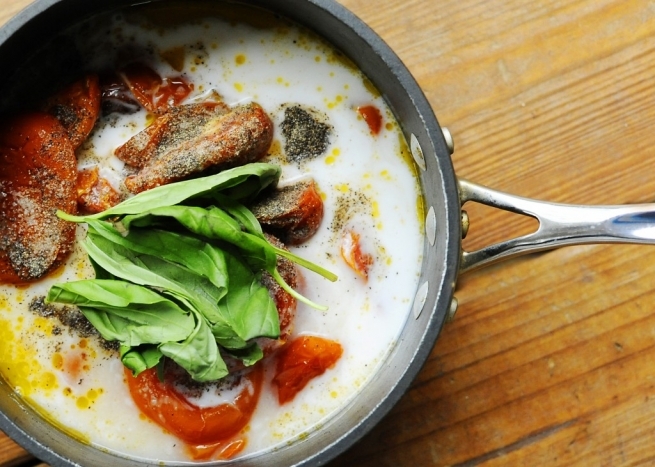 Last winter I had an amazing paleo tomato bisque at one of my favorite restaurants in Atlanta and since then, I have craved it (especially since they don’t make it very often). Anyway, I’ve never made a tomato soup or bisque (and wasn’t even sure how). I just assumed it would be just kind of mediocre since I’m not a big tomato person or even a big tomato soup fan. I was sooo wrong with this soup. It is AWEEEEESSOME!! And, everyone in my family LOVED it. And the bonus, it’s so easy to make. Really! You must try it! Preheat oven to 400. 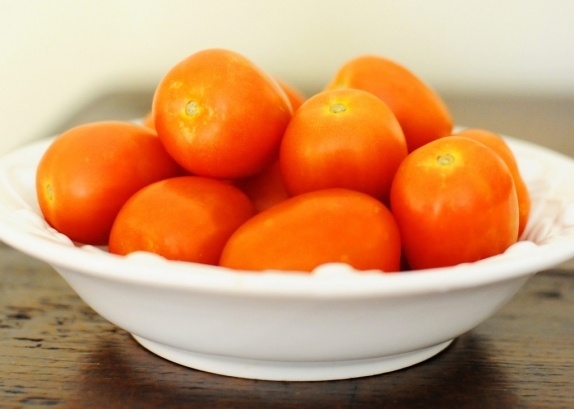 Now, start by cutting your tomatoes in half, or quarters, if they are thick. Next, get out a cookies sheet, cover it with foil and spray with your coconut (or olive) oil. 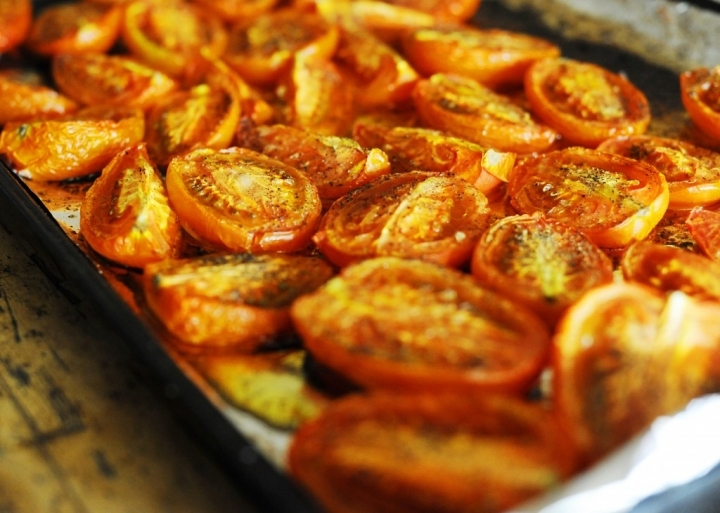 Then drizzle the tomatoes with olive oil, salt and pepper. The salt and pepper sprinkled on the veggies here does not count towards the amounts listed above. Those measurements are for when you are putting all of the ingredients together before blending. Now do the same thing with the onion and garlic but no need to cut the garlic cloves up. I used Trader Joe’s pre-peeled to save time, as always! Now put the veggies in the oven. I put the tomatoes on the top shelf and the onions/garlic on the bottom. 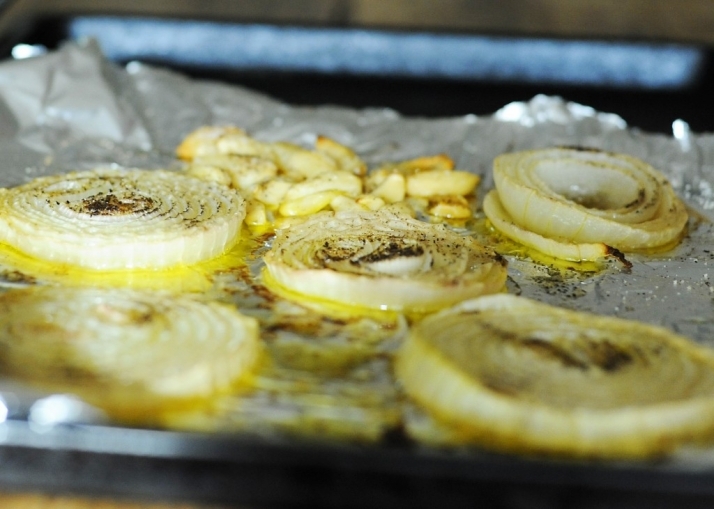 The onions/garlic took about 25 minutes to brown. The tomatoes needed to cook for about an hour and twenty minutes. Obviously everyone’s ovens are a little different so just keep checking around those times. Now put all of the ingredients into a large pot, pull out your immersion blender (I love this thing and use is almost daily! ), and blend until desired texture. You could make it smooth but I left it slightly chunky. Sorry, I couldn’t think of a better word to use that chunky. And wha-la! That is it! And it’s so easy, so good, and great for lunch for the week…if you have leftovers! Heather smith - Just made this with my last-of-the-season garden tomatoes. Riss - Making this for the first time tonight for a cozy Saturday night at home. 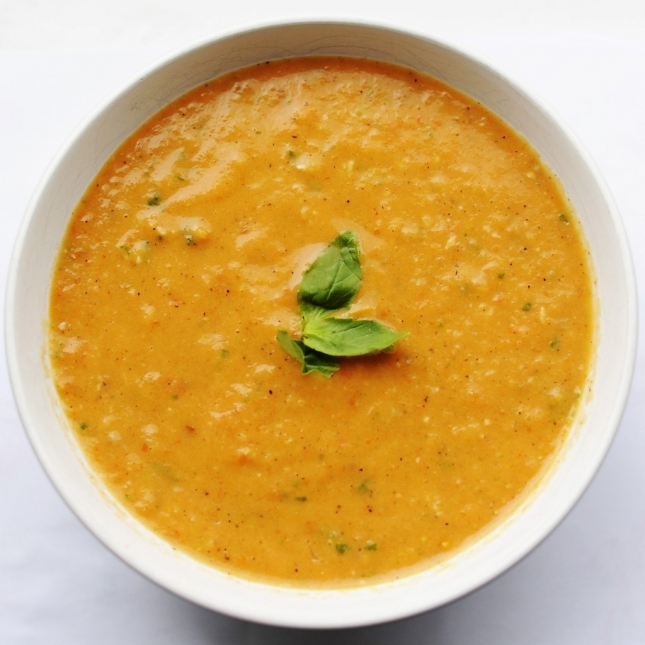 Rebekah Davidson - This is one of my favorite soups! Looking forward to trying this out on my family very much! Do you know how much this usually makes? Or what I could use if I do not have an inversion blender?